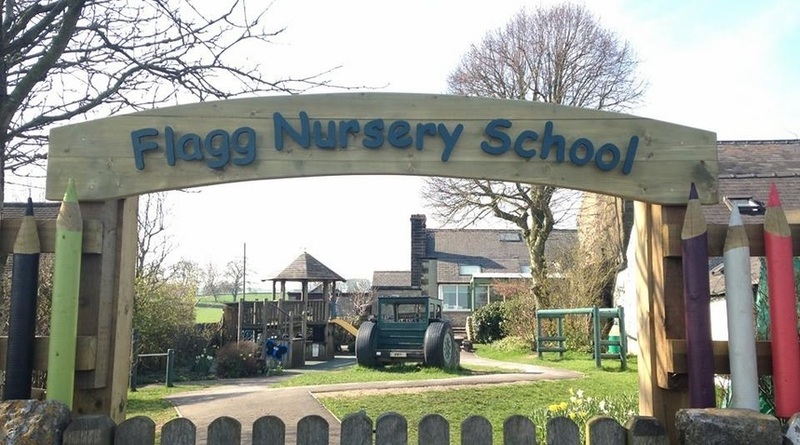 Flagg Nursery School is a Derbyshire County Council school offering education for children aged from 2 and 5 years old. Our children live in the surrounding villages including Chelmorton, Earl Sterndale, Flagg, Monyash, Friden, Sheldon, Taddington, Tideswell, Litton, Over Haddon, Bakewell, Buxton, Youlgrave and Harpur Hill. The nursery is staffed by a Headteacher, qualified teacher, teaching assistants and ﻿support ﻿staff who all work together as a team to provide high quality education. All 3+ year olds are entitled to at least 15 hours of free provision. Most 3+ year olds will be entitled to up to 30 hours of free provision. Funded places are also available for qualifying 2 year olds, for up to 15 hours per week. To find out what you are entitled to please click here to be directed to the childcare choices website. Our sessions run from 9am until 12pm or 9am until 3pm, allowing children to attend for 3 or 6 hours every day. Additional paid sessions, sessions for non-funded 2 year olds and breakfast club are available through our Ofsted registered Little Links childcare. Tiddleypeeps, our stay & play session, is open every Tuesday morning during term time, 9am to 12pm in the Village Hall. All welcome, please tell your friends and family to join us.